What Will the NFL Ratings Be This Week? 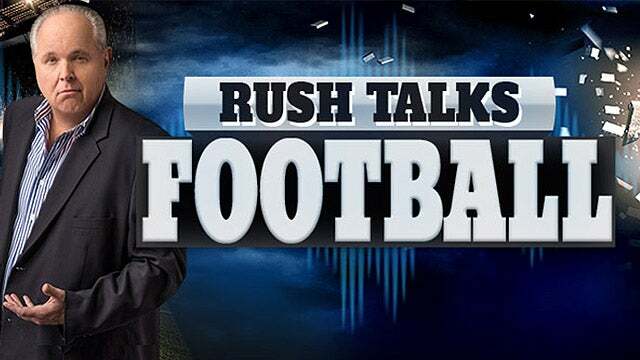 RUSH: What do you think the NFL ratings for the weekend are gonna be? They’re way, way down even with last week’s big divisional playoff game. You got the Jacksonville Jaguars and the New England Patriots at three o’clock on Sunday. I will be on the golf course. I am going to play golf. I’ll tee off at 1 o’clock, I’ll finish around five, I’ll get home for maybe the fourth quarter, if I watch, and then the night game. The night game, the Philadelphia Eagles hosting the Minnesota Vikings. So Snerdley, what do you think the TV ratings are gonna be? I don’t want to slight any of these teams. I mean, they’ve gotten where they are, but, I mean, this is not like the Steelers v. the Patriots or the Cowboys v. the Eagles. Nothing against Minnesota. I think Minnesota’s got a whole bunch of brand-new fans this week after last week’s game, that never-before-seen kind of comeback. What if the Super Bowl is the Jacksonville Jaguars and the Philadelphia Eagles and their backup quarterback? (laughing) You might see Roger Goodell offering a recount. “Could we play that Pittsburgh-New England game again? You know, we just found something in the video replay here that it looks like actually the Steelers should have won that game.” No, not possible.